Begin by preparing your eggs. Use a corkscrew or a knife to poke a small hole in the top of each egg. Then carefully widen the hole to the size of a dime, and then empty out the contents of the egg, being sure to reserve 3 eggs for this recipe. Rinse each egg. Then carefully submerge all of the eggs in a large pan of salt water for at least 30 minutes. Remove, and place in a 12-cup baking pan, using aluminum foil to help secure the eggs so that they are sturdy and sit right-side up in the baking cups. Meanwhile, prepare your white cake mix according to package directions. Add in your desired amount of food coloring. Then use a piping bag (or a Ziplock with the corner snipped off) to pipe the batter into each egg until they are each 2/3 full. Do not overfill. Bake the eggs at 350°F for 20-25 minutes, or until a toothpick inserted down the middle of each egg comes out clean. If the batter has overflowed, use a flat surface (like a dull knife) or a warm cloth to wipe off the excess batter. 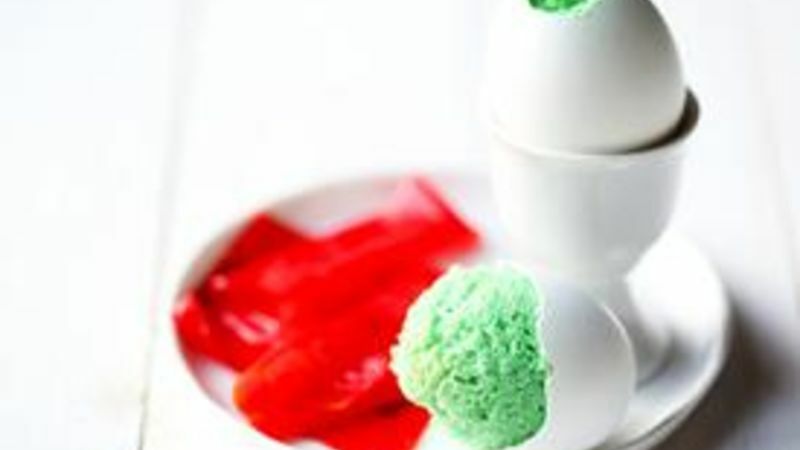 Serve the green eggs with Fruit Roll-Ups (the ham)! You do not like green eggs and ham? You do not like them, Sam I am? Well, pretty sure you haven’t tried THIS version of Green Eggs and Ham! To celebrate Dr. Seuss’ birthday, we have given the classic a sweet twist this year. To the surprise of all your friends and family, the green “eggs” turn out to be delicious green cupcakes cooked inside of (real) eggshells. And then the “ham” is none other than a sweet Fruit Roll-Up. You can even enjoy them in a boat, with a goat, in the rain, on a train, with a fox, in a box, or ANYWHERE you’d like! Just be sure to wish Dr. Seuss a happy birthday as we give thanks for the amazing books and great reading times he has inspired for generations. First, we get to hollow out the eggs. Poke a hole in the top of each egg. Widen the holes to about the shape of a dime. Then rinse them out, and soak them in saltwater for 30 minutes. Meanwhile, prepare a white cake mix, turned green with food coloring. Pipe it into each egg until it is about half full. Place the eggs in a baking tin and use aluminum foil to secure the eggs, so that they stand upright. Then bake for about 20-25 minutes at 350 until the cake is cooked through. Let them cool, then serve them and let your guests enjoy the “sweet” surprise when they crack open their eggs! And then go ahead and read the classic to celebrate!! Ali loves music and fun food! Check out her great stuff at her blog site, Gimme Some Oven, and her Tablespoon profile — and keep watching Quick Dish to see what colorful, nommy recipes she dreams up next! You can also serve your Green Eggs & Ham with these adorable Lorax’s Truffaua Trees!